The following screen shot shows PACSProbe in action. You can see the input masks used to extract data items “Facility Code” and “CardNumber” from a 26 bit HID PROX card using an OMNIKEY 5321 CK smart card reader. All you need is an OMNIKEY PROX or iCLASS card reader and CardWerk PacsProbe to make this work at your site. 26 bit Wiegand data is displayed as raw bit array. 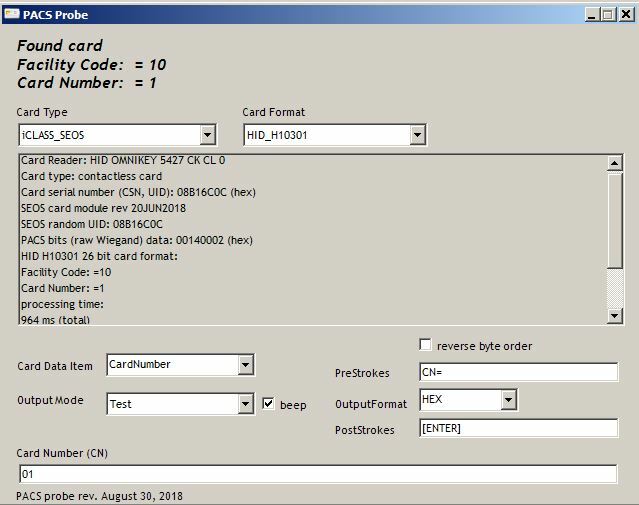 PACSProbe then extracts card number and facility code based on the HID H10301 standard Prox card format used for this card. Note, that Output Mode is set to test mode here. This allows you to test the output before enabling keyboard wedge mode. The resulting card number is displayed in HEX. It is also placed in the keyboard buffer if output mode is set to Keyboard Wedge. PACSprobe is implemened using CardWerk SmartCardAPI(professional) with its EzOutput Software Wedge.